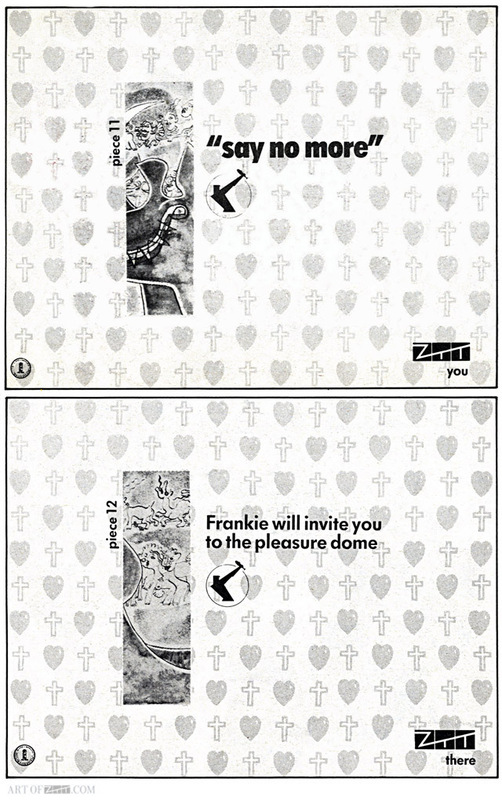 artist: Frankie Goes To Hollywood title: Welcome To The Pleasuredome format: 1/8 pg NME advert design: XLZTT illustration: Lo Cole cat. no: ZTT IQ 1 date: 27/10/84 art of notes: This was the eleventh and twelfth of 12 adverts that appeared in various music papers in the two weeks prior to the release of the album. Each piece contained a slice of the inside gatefold image by Lo Cole that would form the entire image if folded and placed together. Two pieces appeared each week, usually on different parts of a page or spread but I’ve put them together for each post relevant to the issue they appeared in. The ads in the larger weekly papers were bigger in size but the slices of the image remained the same as the smaller ads.